Harvest of the Month | What's not to like? 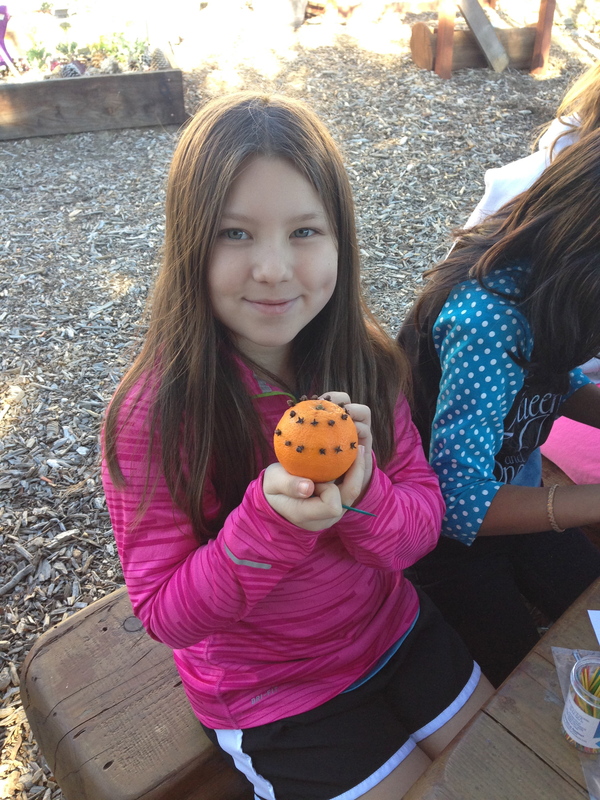 ….making orange pomanders with whole cloves…. 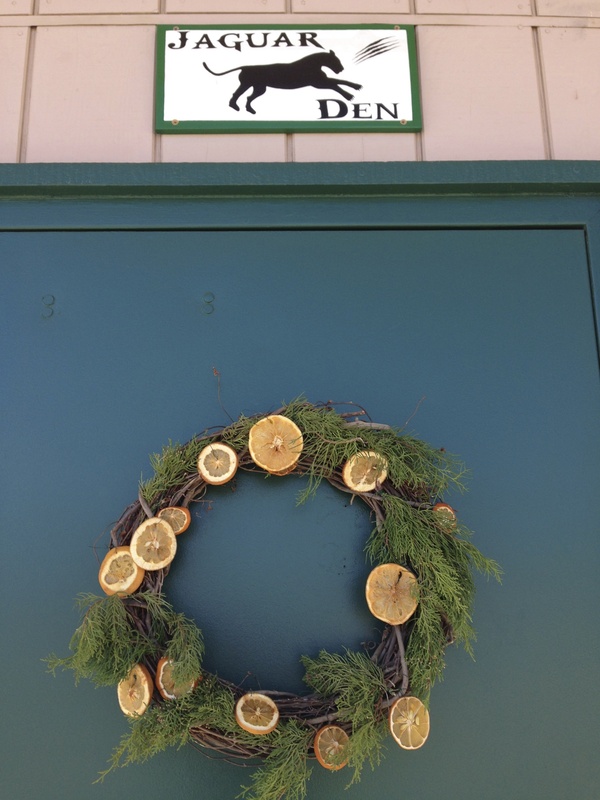 …..creating a seasonal wreath with oven-dried citrus rings to decorate the Club Jaguar door…. 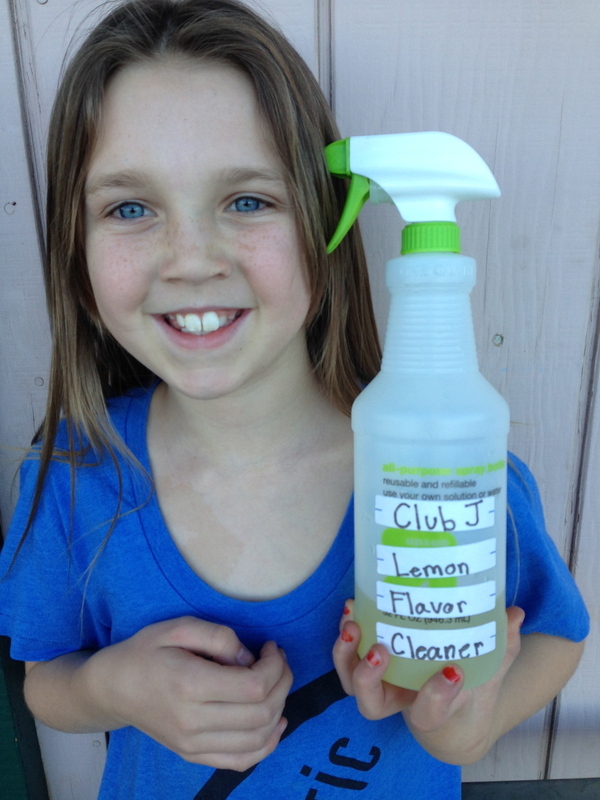 ….and sending kids home with lemons and recipes to make lemonade, cleaners and invisible ink! Our “harvest of the month” is strawberries, and I tried out a new idea this year that worked well. 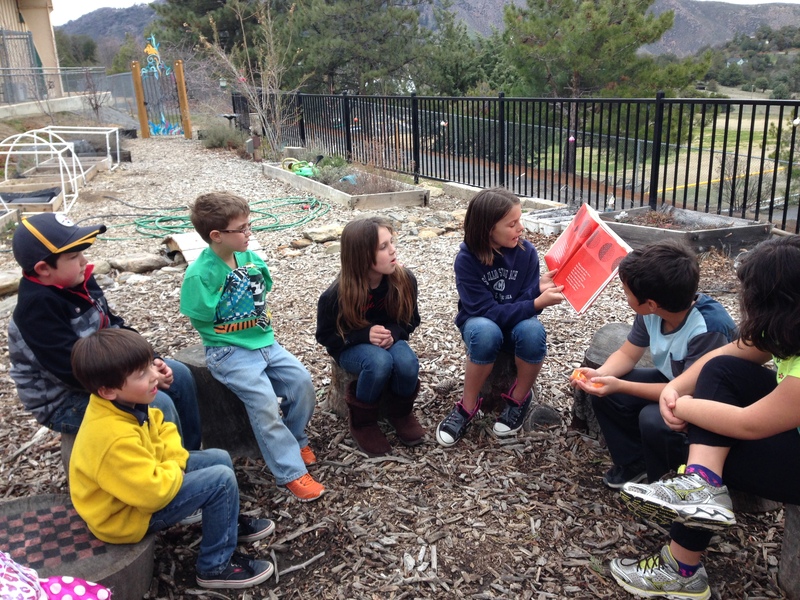 Fifth grade students were split in groups that switched halfway through the lesson. One group worked on potting strawberry runners; the other transferred 30 strawberry facts on to paper cutouts, which I later laminated and attached to skewers. 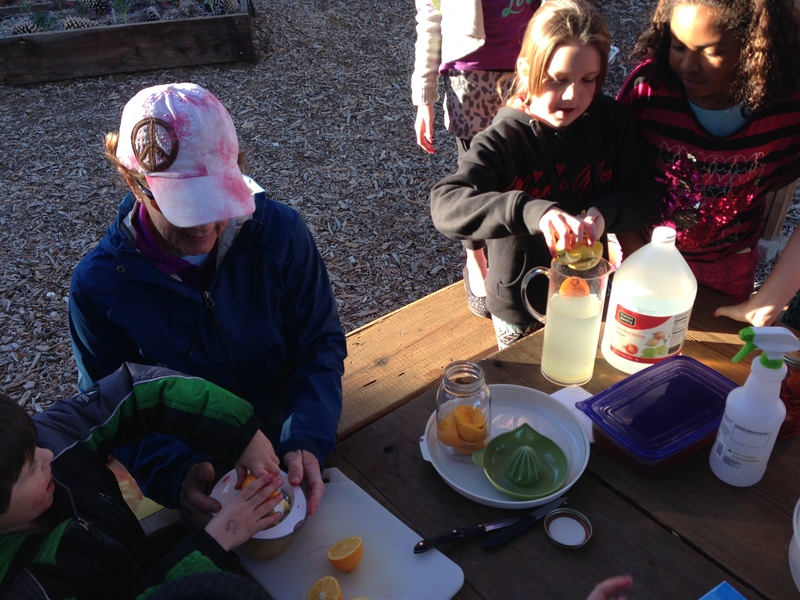 We also feasted on local strawberries, since ours aren’t quite ready. 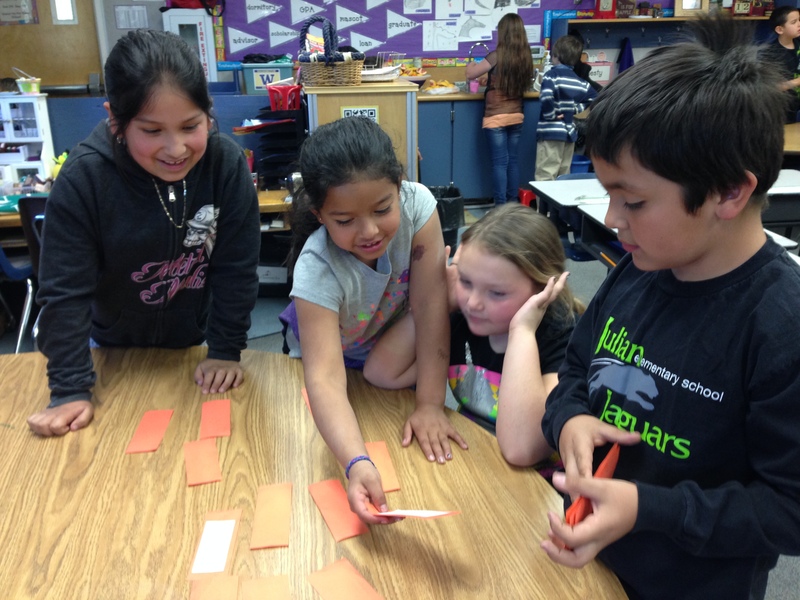 Still later, second grade students went on a strawberry scavenger hunt to fill in the missing blanks on this “quiz” pasted into their journals. 1. It takes about_____days for a flower to turn into a fruit. 2. Strawberries are delicate and must be picked__________. 3. The Spanish word for strawberries is _________. 4. Strawberries are in the__________ family. 5. 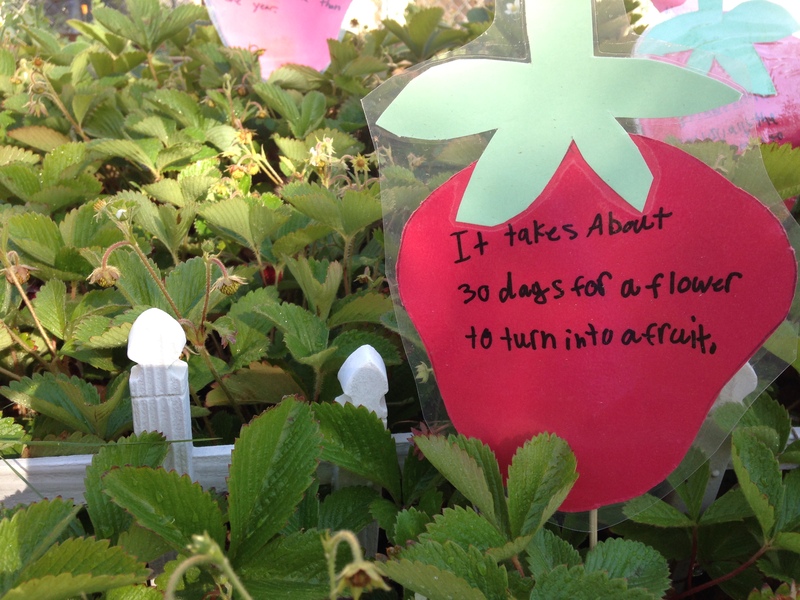 There are about ______species of strawberry plants. 6. 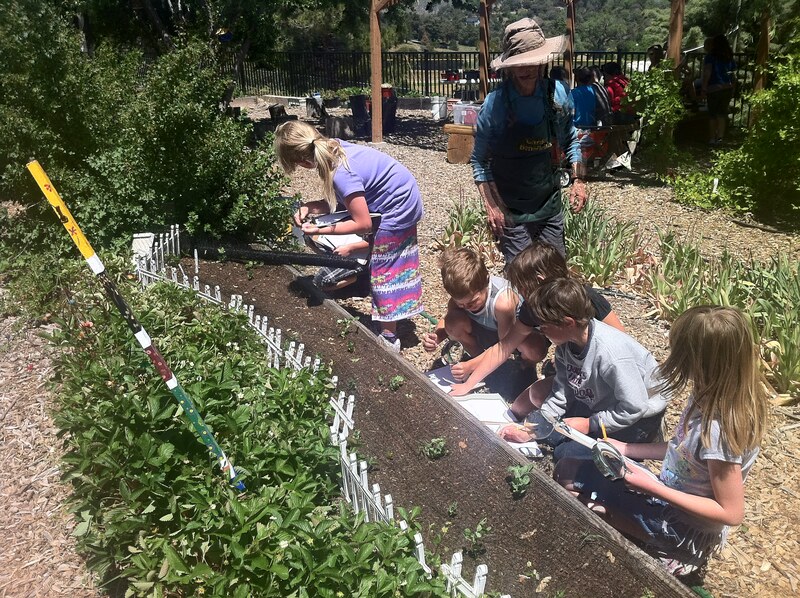 Strawberries produce “runners” or __________ that produce new “daughter” plants. 7. Strawberries like ____________days and ____________ nights. 8. Strawberries are usually the first fruit to ripen in the________. 9. On average, there are ____________ tiny seeds on every strawberry. 10. Strawberries are the only fruit that wears seeds on the ____________. 11. Strawberries have lots of vitamin _________. 12. Strawberries are perennials. This means they live more than ________________. 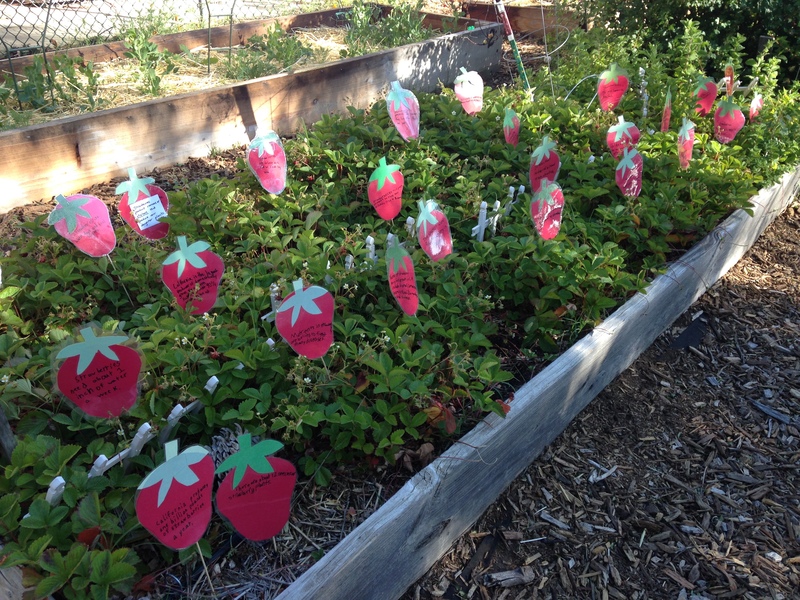 Afterward, I “planted” all of the signs in one of the strawberry beds for an ongoing educational display. I think it’s a sweet touch! It’s official–it’s on the marquee. 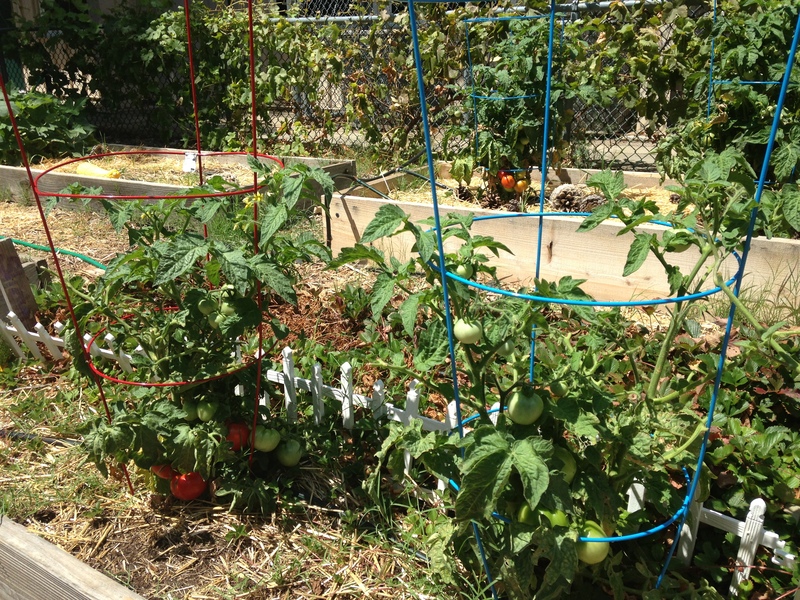 Planted in June, these tomatoes will be ripening right on time. 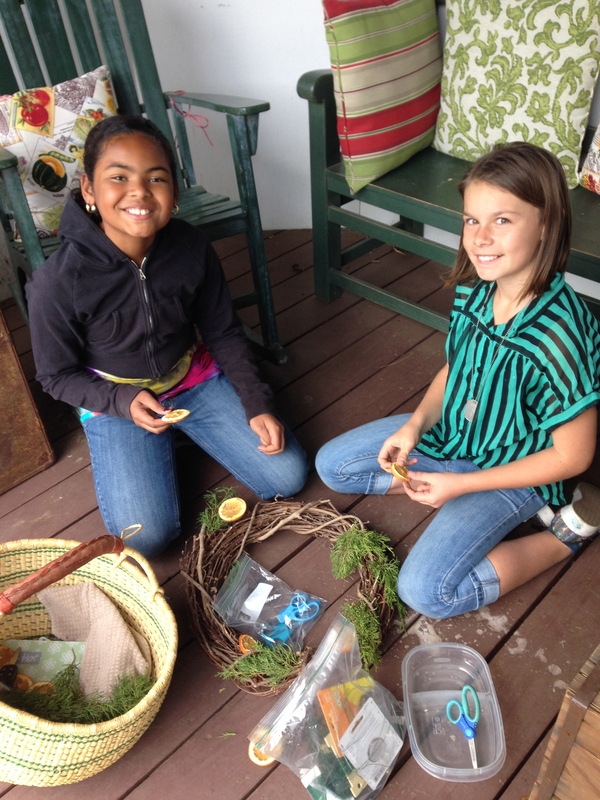 For the month of September, we will be harvesting and eating all of our garden-grown beauties. 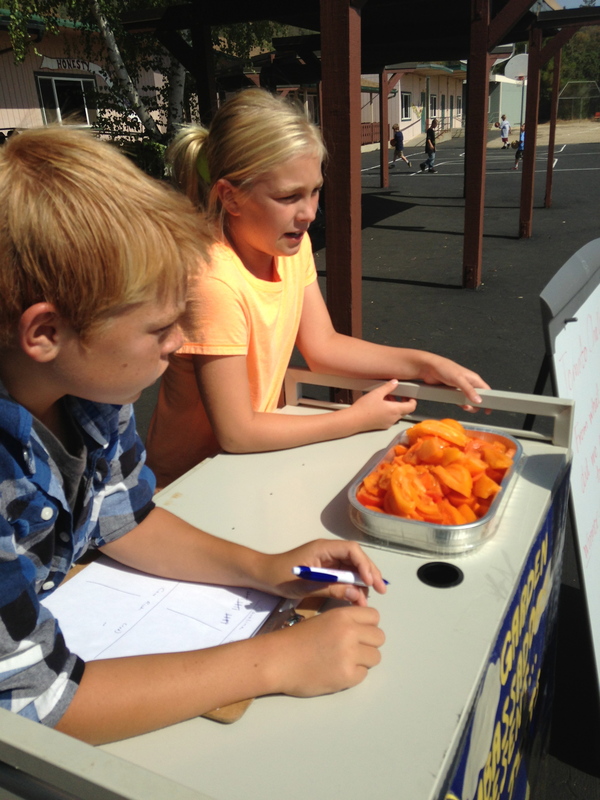 Arranged by school board member Mrs. Tellam, the Farm Stand in Escondido donated a box of Carolina Golds and Caro Rich that we took out to recess……. 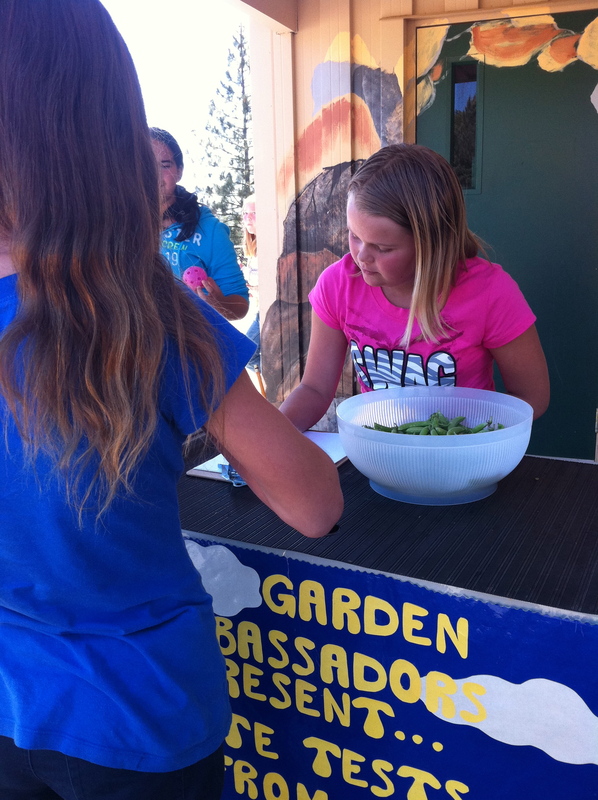 …so that the Garden Ambassadors could run a taste test. 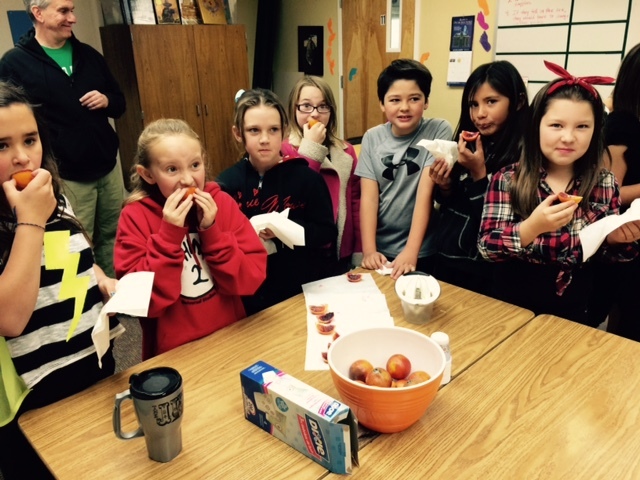 Our principal/superintendent Mr. Ogden is interacting with the kids, encouraging them to have a taste and exclaiming how delicious the tomatoes are! The ambassadors always take a poll: thumbs up or thumbs down. (Only one reported thumbs down.) 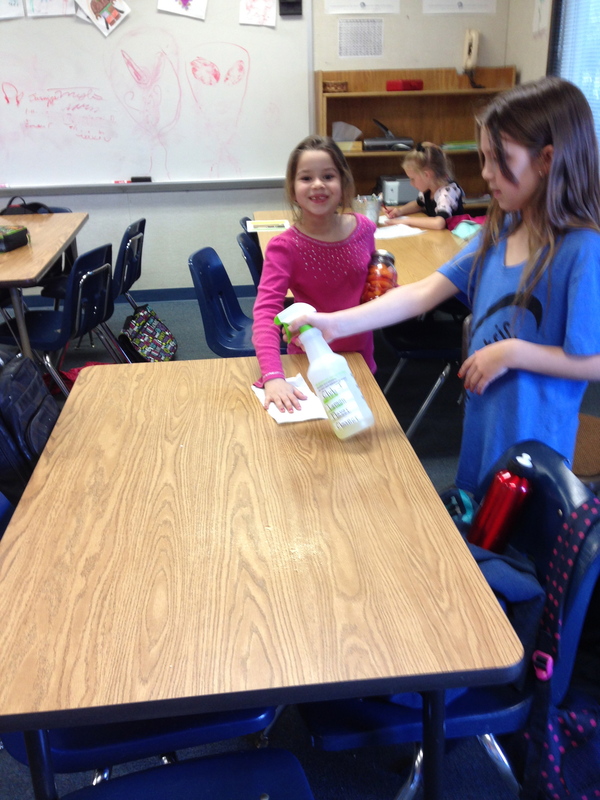 They also asked the “tomato challenge”: letting kids know tomatoes don’t come from Italy (a common guess!) but from Central and South America. 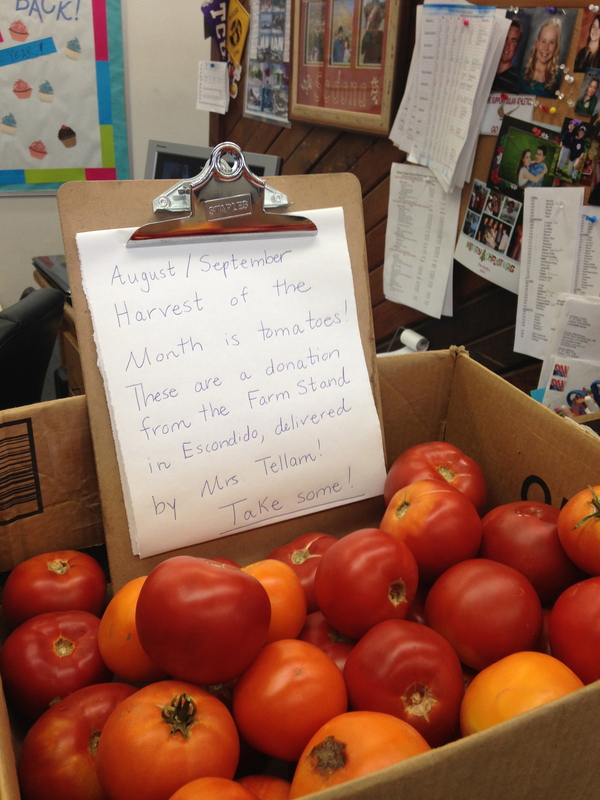 We had some left over, so we put them in the front office so that kids, parents and staff could take one or two home. 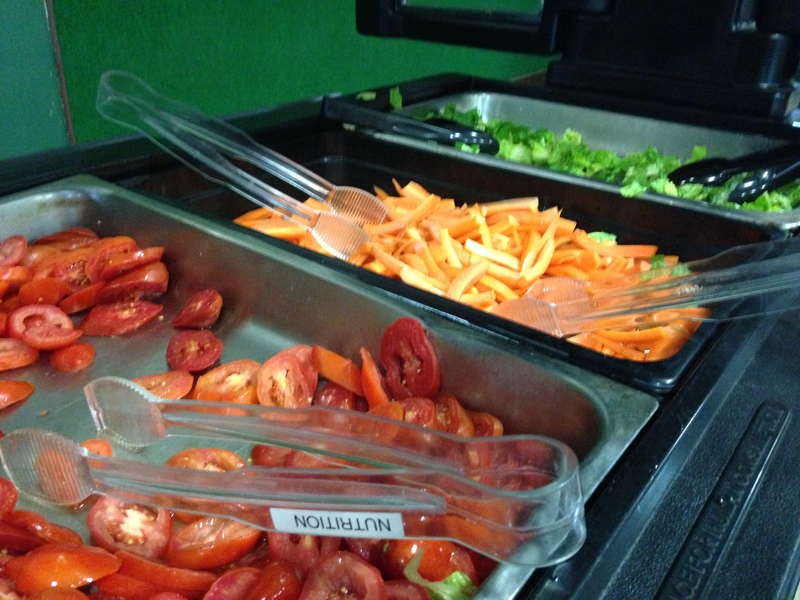 Our brand new lunch menu has been featuring gorgeous local heirloom tomatoes so the hope is that all of this education will ultimately make kids more receptive to/excited about them when they see them on the salad bar. Yum! 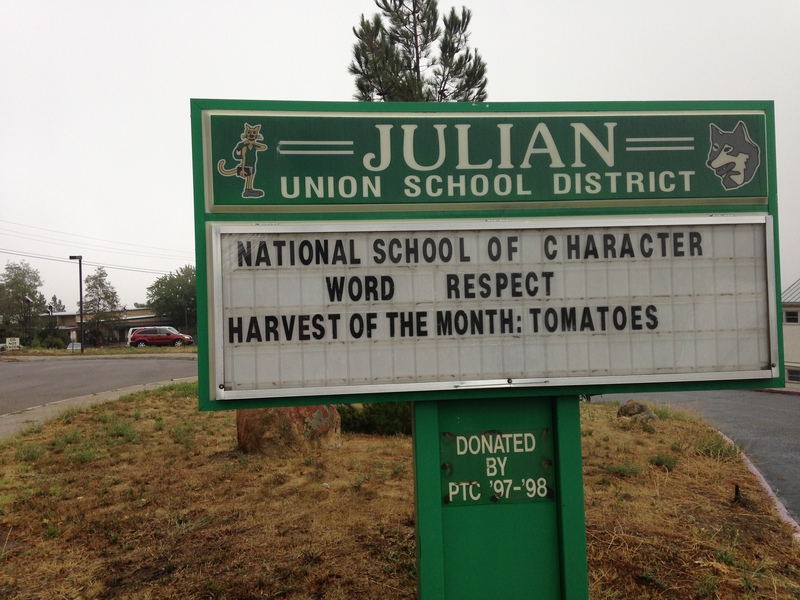 Next year I will be leading the effort to introduce a Harvest of the Month program at our school. To get it started, we’re doing a pilot this month. 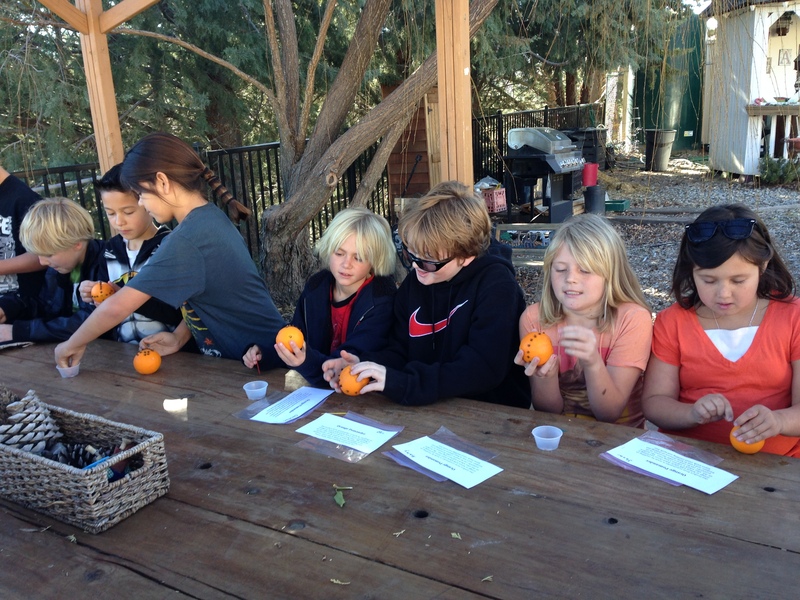 The backbone of this program is a set of excellent resources provided by a Network for a Healthy California (http://www.harvestofthemonth.cdph.ca.gov). 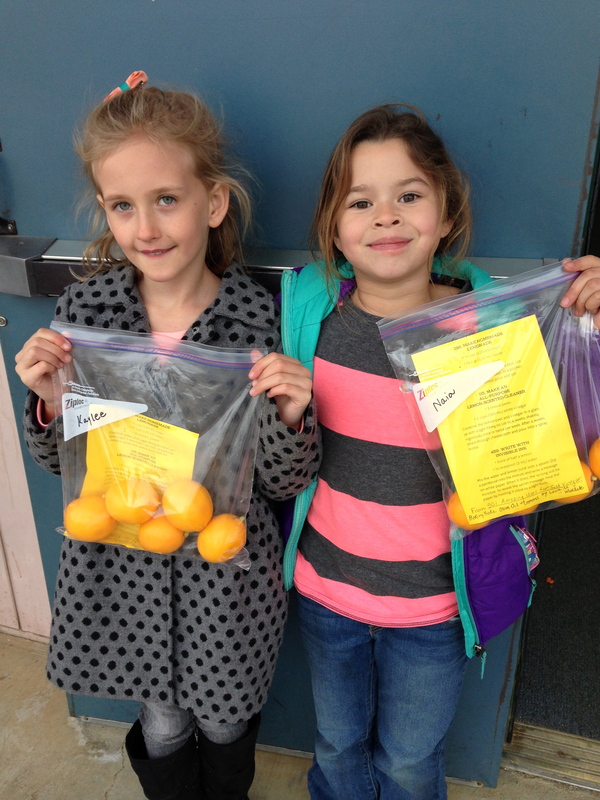 For each fruit or vegetable, they provide an educator guide, a parent newsletter, a community handout and a menu template on which you can print your school lunch calendar. I attended the all-district staff meeting at the beginning of the month to introduce the program and pass out information to the teachers. 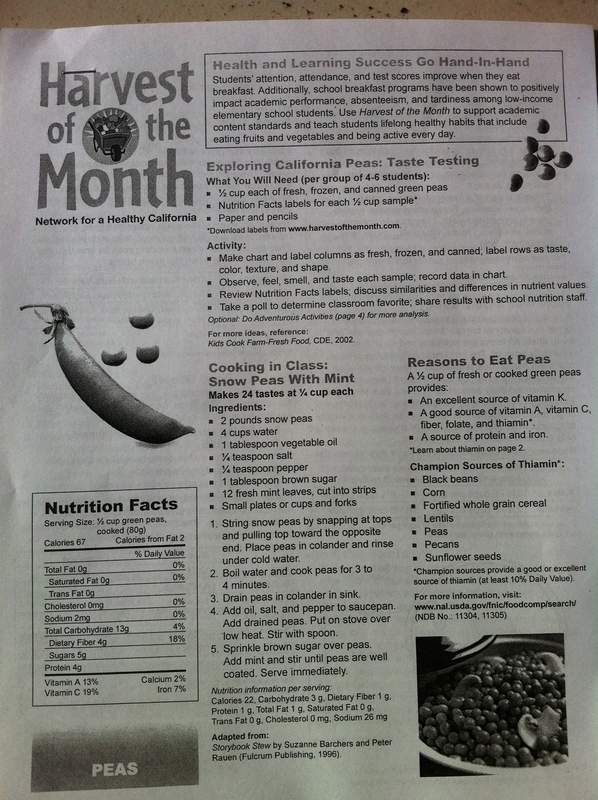 These multi-page guides have lots of information about the selected fruit or vegetable: nutrition, history, botany, recipes, science, literature links, etc. 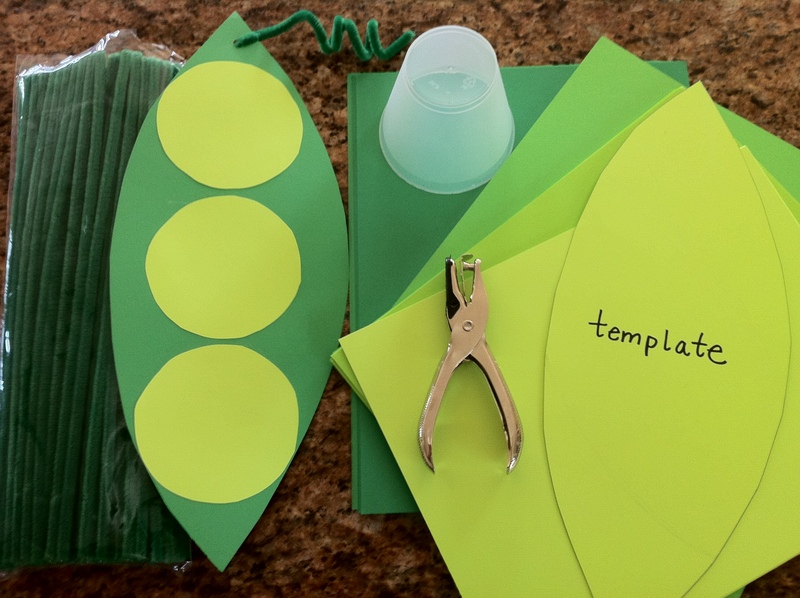 Tip: Michaels has a single pack of cardstock greens in all different shades. 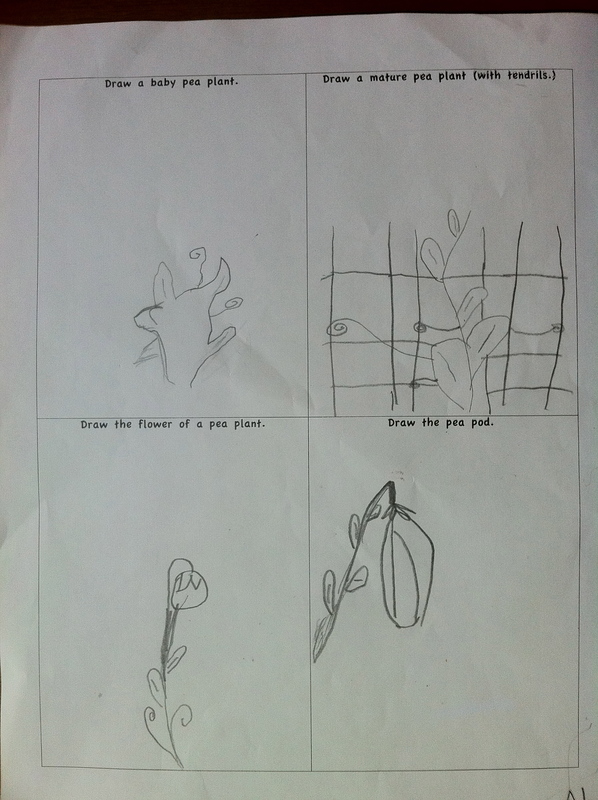 At another station, the students did a set of drawings of peas, which were planted in succession so that they could observe them at different stages of growth—also, to stretch out the harvest. 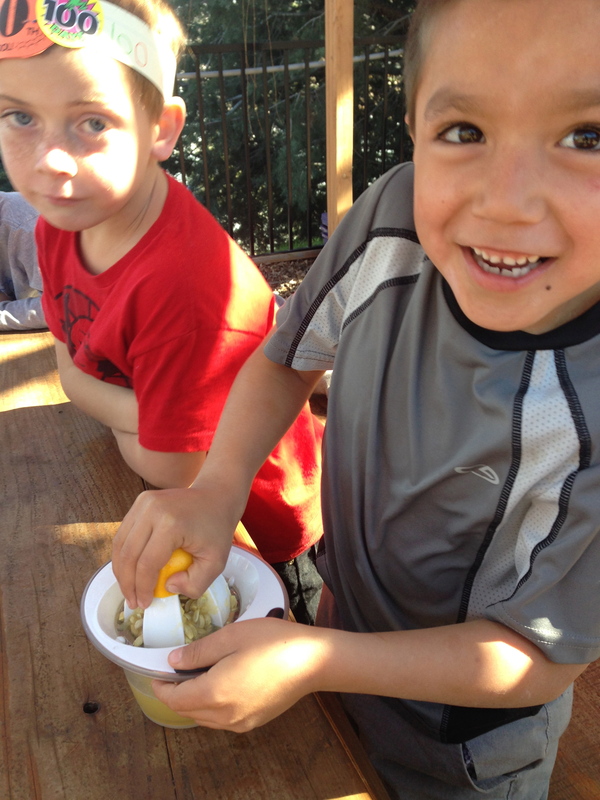 At my station we sampled sweet pea hummus, and we talked about all of the ingredients. 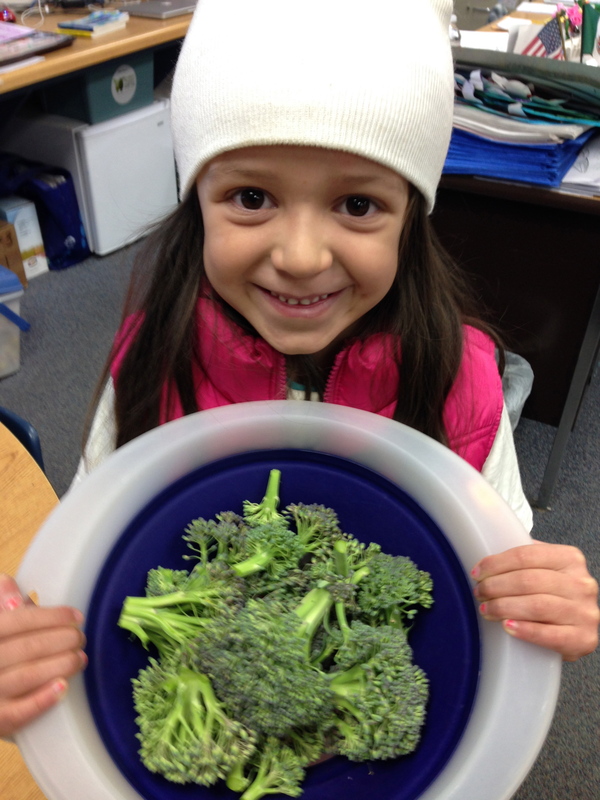 We also did a fennel taste test because I had some to use from our donated produce box. 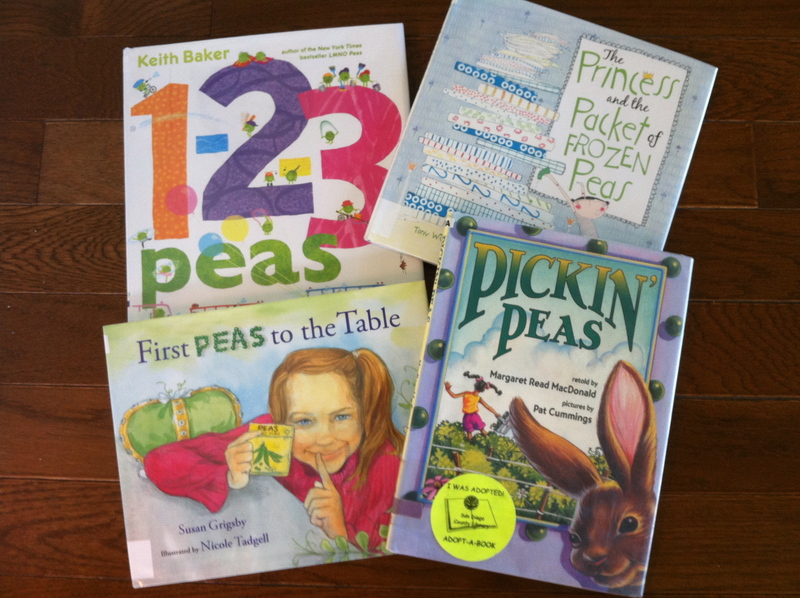 I’m going to teach more pea-themed lessons this month so I’ve been checking out every children’s book I can find with the word”pea” in the title and creating a working annotated bibliography. I’d love to find a grant to eventually purchase every title on the list. 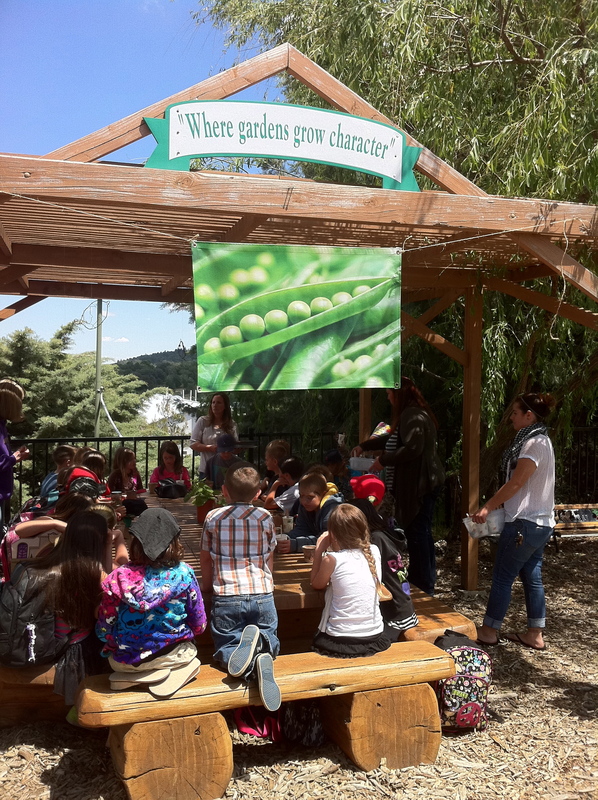 We also made some decorations for the garden to announce the monthly harvest. 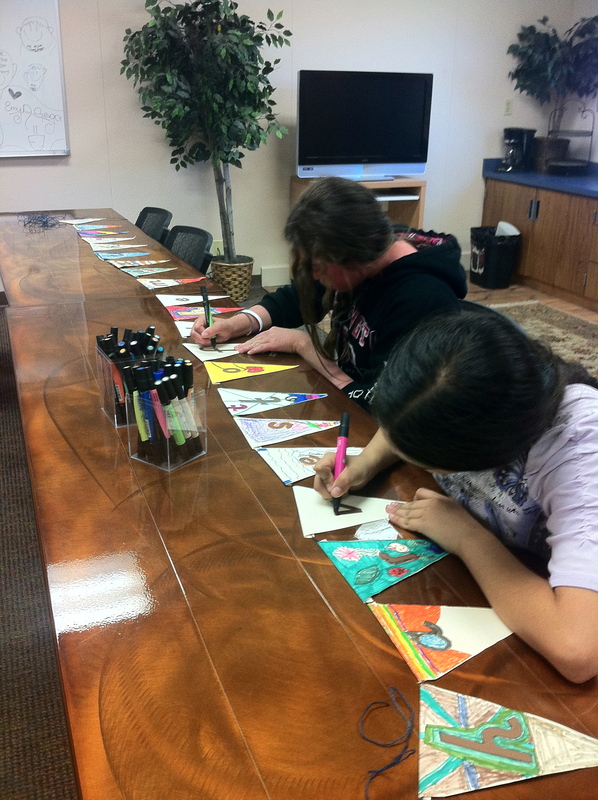 Here our 8th grade PLUS leadership kids are finishing up a banner started by the fourth grade. This is a banner I had printed locally. 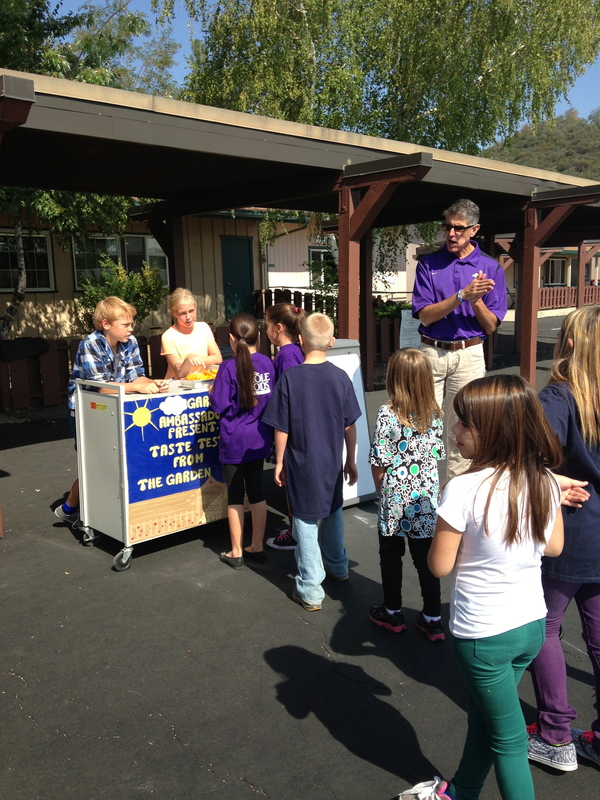 And finally, a taste test! 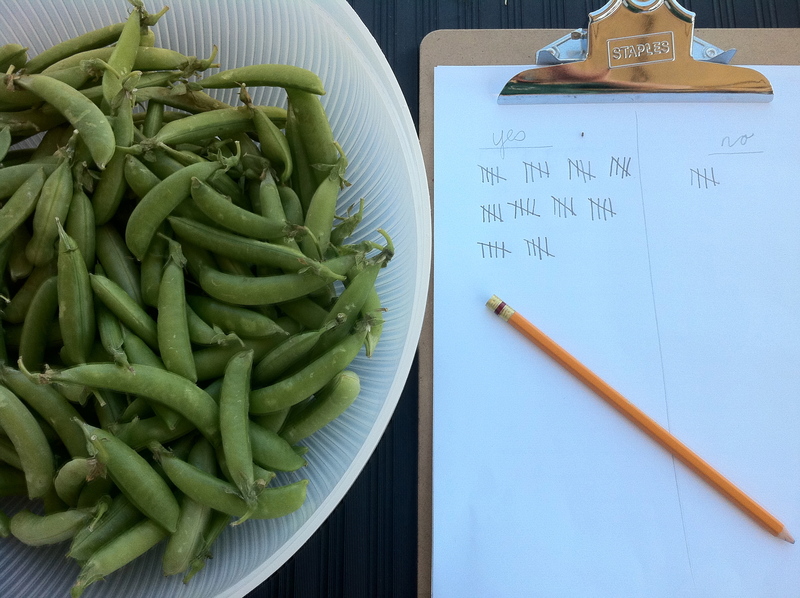 Snap peas were in our Be Wise Box this week, and I supplemented them with 2 lbs. 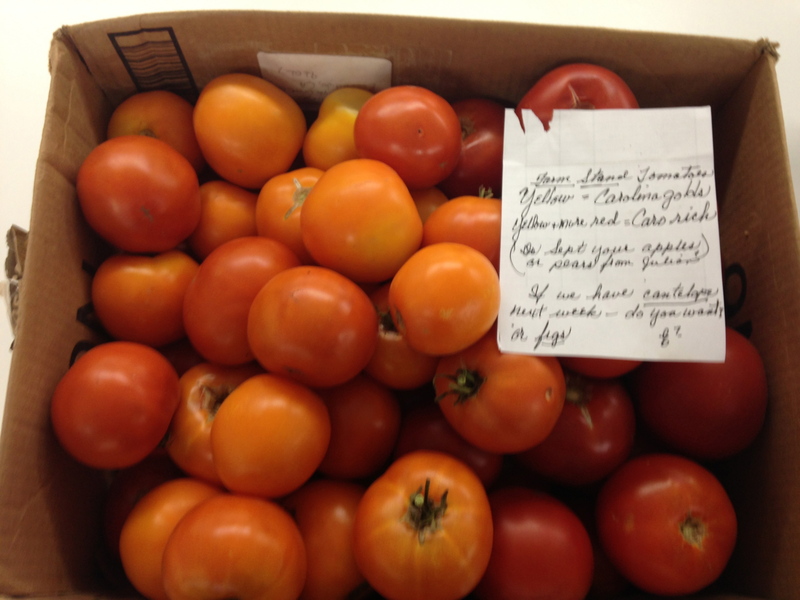 from the Warner Springs Farmers Market I visited last night. 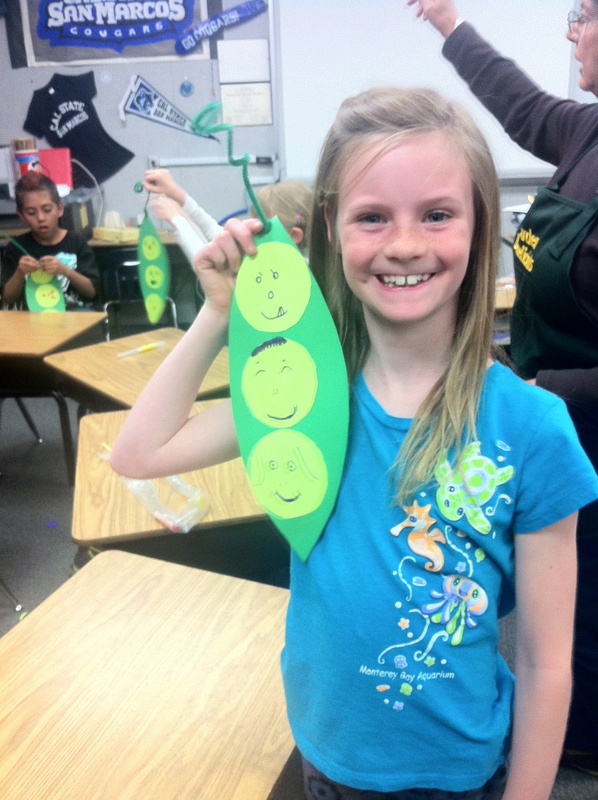 An ambassador took data (“”Do you like it?”), and once again, the peas have it!